History was made at Madison Square Garden on December 9th as it marked the first time in boxing that two-time Olympic gold medalists fought each other as professionals. WBO junior lightweight champion Vasily “Hi-Tech” Lomachenko defeated WBA super bantamweight champion Guillermo “El Chacal” Rigondeaux via 6th round TKO in a bout televised live on ESPN. Prior to the bout both fighters agreed to donate their fight gloves for display in the Hall of Fame and, following the contest, Hall Executive Director Edward Brophy was center ring to accept the gloves. Also, at the post-fight press conference, Lomachenko surprised the Hall of Fame by presenting his fight-worn boxing trunks for display as well. “The Hall wishes to thank both fighters, as well as Hall of Fame promoter Bob Arum and his team at Top Rank – Todd duBoef, Lee Samuels, Brad Jacobs, Fred Sternberg, Carl Moretti, Mikey Williams and Gardy Lopez; Roc Nation Sport’s Michael R. Yormark and Dino Duva for recognizing that today’s action is tomorrow’s history,” said Brophy. 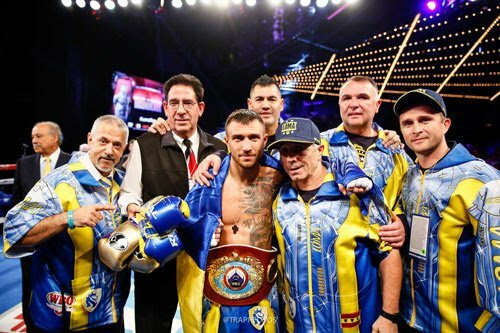 The bout, for Lomachenko’s 130-pound title, headlined an all-action card presented by Top Rank, in association with Roc Nation Sports and Madison Square Garden. The card was televised live on ESPN and ESPN Deportes and was watched by an average of 1.73 million viewers. A not-for-profit organization, the International Boxing Hall of Fame opened to the public in 1989 in Canastota, New York and is located at Exit 34 of the New York State Thruway. Hours of operation are Monday-Friday 9 a.m. to 5 p.m. and Saturday-Sunday 10 a.m. to 4 p.m.
For more information please call the Hall of Fame at (315) 697-7095, visit online at www.ibhof.com, on Facebook at www.facebook.com/International BoxingHallofFame and on Twitter at www.twitter.com/BoxingHall.